The government is entering its seventh day of the shutdown and Washington DC is empty. The cowards in Congress fled the scene of the crime, but Trump stayed behind, determined to solve the deadlock. But Trump cannot do this all alone and the cowards in Congress should get back to DC and get to work, but first, we have to pry Nancy Pelosi from her expensive vacation. From the Free Beacon: Democratic House leader Nancy Pelosi is spending the government shutdown at a luxury resort in Hawaii, the Washington Free Beacon has learned. The resort, on Hawaii’s Big Island, features a golf course, six restaurants, and a 10,000-square-foot oceanfront pool. It also features a “Spa Without Walls,” where the 110-minute Ali’i Royal Experience is available for $369 and a 50-minute couples massage runs $549, according to the spa menu. While at the spa, guests can snack on a gluten-free grilled prawn summer roll for $19. It should be noted lest anyone forget that Nancy Pelosi is one if the richest members of Congress and fleeing the crisis she helped cause may very well be a “let them eat cake” moment from she will never recover. 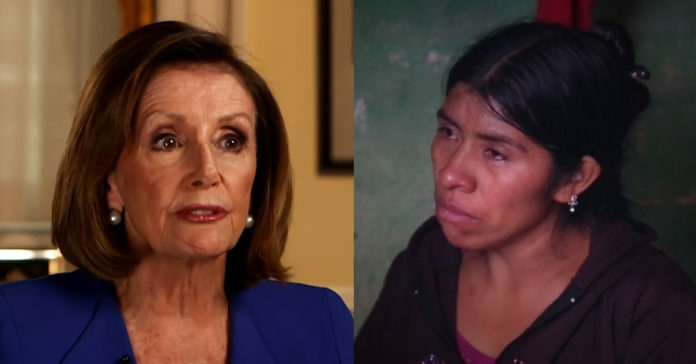 The mother of an 8-year-old Guatemalan boy who died in U.S. custody came clean and just embarrassed Nancy Pelosi and the obstructionist Democrats in the process. She revealed the real reasons her family made the dangerous journey to the promised land of the United States of America and why a young child made it in the first place. Look, there may be some of these migrants who are fleeing violence but many more are fleeing poverty. From The Daily Caller: In an interview with Reuters, Catarina Alonzo said that her husband took her son with him to the border in the hopes that the child would afford them easier entry into the United States. Instead, 8-year-old Felipe Gomez Alonzo became ill and passed away. “Lots of them have gone with children and managed to cross, even if they’re held for a month or two. But they always manage to get across easily,” Alonzo told Reuters through sobs. Alonzo said that her husband, an agricultural worker, wanted to get to the U.S. to find better work to pay off his debts. He also hoped that he could enroll Felipe in a higher quality school. From Reuters: Marta Larra, a spokeswoman for Guatemala’s Foreign Ministry, said smugglers known as “coyotes” often encourage migrants to take children as a form of “visa.” Many coyotes, she noted, are trusted by migrant families, so their word carries weight. Our laws are clear and while we are the most generous nation on the earth, we must follow our laws and if people learn how to game them for their benefit we need to change the laws to reflect the real conditions on the ground. This is not complicated, regardless of what the obstructionist Dems will say. CNN wasted no time in trashing Trump for the unpardonable sin of visiting the troops over Christmas. Believe me, if they trash him for that nothing he does will ever be good enough. But they didn’t stop there, CNN also went after our beloved troops and claimed they made some serious infractions for showing their support for Trump and got embarrassed for their shoddy reporting. 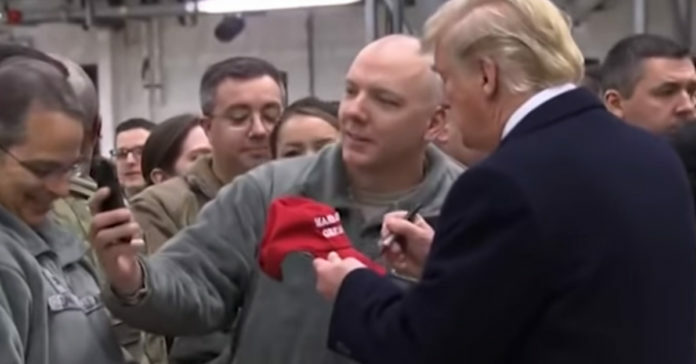 Enter the truth, from Military.com: U.S. Air Forces Europe said troops holding “Make America Great Again” hats during President Donald Trump’s visit Thursday to Ramstein Air Base were not in violation of military rules that prohibit taking part in partisan activities while in uniform. 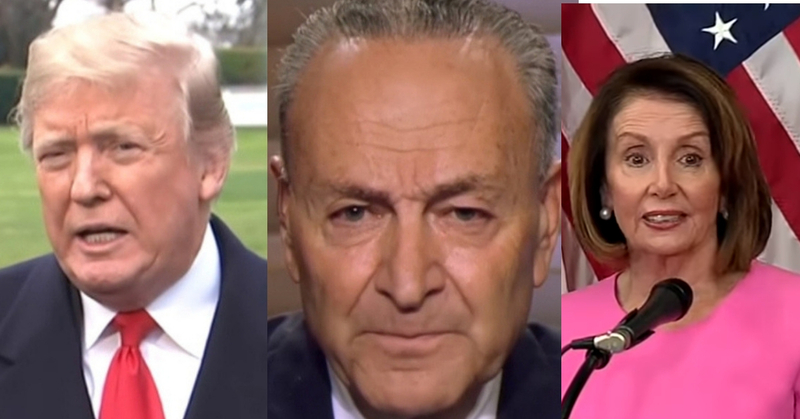 President Trump is done playing games and is ramping up the pressure on the Democrats to finally do the right thing. Look, the left has already approved measures to fund the wall in the past two years but court decisions and late additions to the bills doomed them. So they have voted in the past for border security and they will again – they just need the right pressure and leverage applied. In a series of blistering tweets today Trump laid down the law before finding a skeleton in Barack Obama’s closet and exposing it for maximum effect. First, he went after a Democrat talking point and destroyed it. 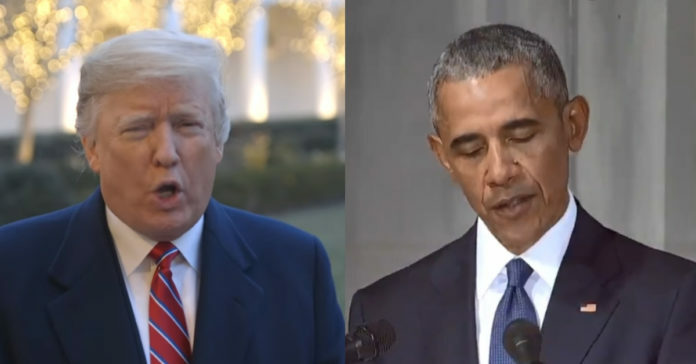 Then Trump dug deep into Obama’s closet and dragged out his most notorious skeleton then used that to drive home what is at stake over the border wall. 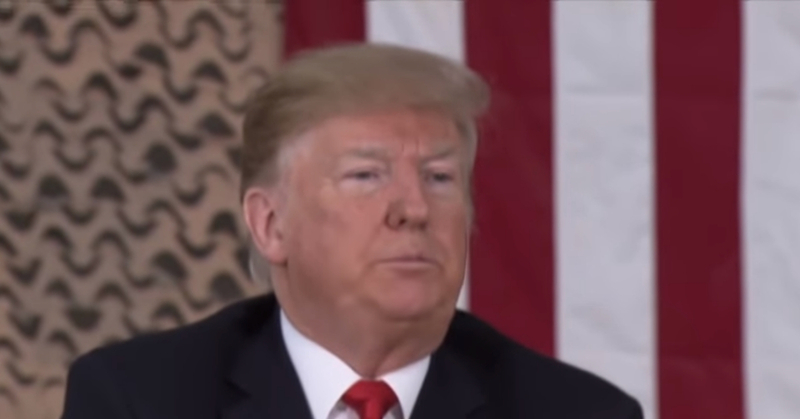 From The Hill: President Trump on Friday threatened to “close the Southern Border entirely” if Democrats do not agree to provide money to “finish” building a wall on the Mexican border. Trump made the threat in a series of tweets on the seventh day of a partial government shutdown that entered its seventh day on Friday with no end in sight. President Trump inherited a mess caused by greedy cowards who literally sold out the USA for short-term cash. They sent our jobs and worse, our advanced technology to the Chinese or sat back while they stole the secrets that make out tech the best in the world. To be kind to our hapless leaders of the past, they thought they could move China away from capitalism and towards freedom and democracy. It didn’t work, instead, we created a monster that Trump has to capture and put back in the box. We gave China a chance and they betrayed that trust as they moved towards a hardline authoritarian future that will be a nightmare for its citizens. Worse, they want to spread their horrific vision for the future to other parts of the globe. Enter President Trump. The issue is the new 5G cell networks that are rolling out across the world – China wants everyone to use their technology rather than US tech. Many countries – Austraila, England, to name just two are working with Trump to ban Chinese tech over surveillance fears. From CNBC: President Donald Trump is considering an executive order in the new year to declare a national emergency that would bar U.S. companies from using telecommunications equipment made by China’s Huawei and ZTE, three sources familiar with the situation told Reuters. From The New York Post:It would be the latest step by the Trump administration to cut Huawei Technologies Co.s Ltd. and ZTE Corp., two of China’s biggest network equipment companies, out of the US market. The United States alleges that the two companies work at the behest of the Chinese government and that their equipment could be used to spy on Americans. 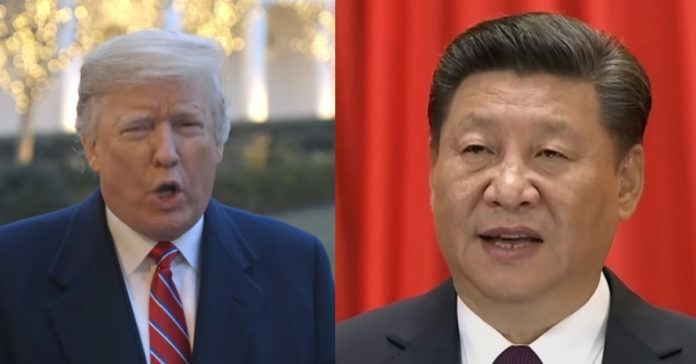 President Trump is about to do what is necessary with the very real threat from China and most sane observers say it is about time. For too long have we sat by and let China steal our technology and our jobs while our weak politicians did nothing and our greedy CEO’s cashed in. They sold us out and in doing so created a viable national security threat from a newly modernized China. Based on China’s past misbehavior, this is a mandatory move and one Trump is leading. 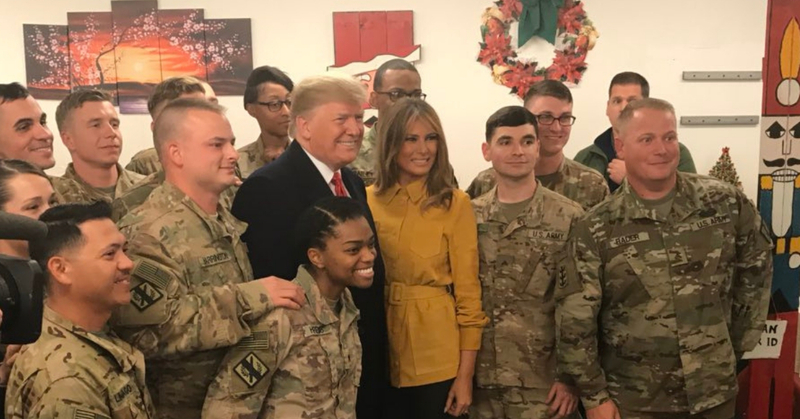 President Trump stunned his critics by making a surprise visit to war zone troops this Christmas, removing one more thing that media and Democrats can bash him for. To say they have a double standard for Trump is an understatement and the fact that they do not give him any positive coverage is hurting their credibility at a time when they cannot afford it. The media has turned into a tabloid version of its former self, running gossip and rumor over fact which is why Trump keeps winning. From MSN: The border wall has been the focal point of government funding negotiations between Capitol Hill and the White House. The Senate initially passed a bill without the border wall funding, but Trump, after facing pressure from several conservative allies, declared the next day he would not sign it without money for his signature campaign promise. The House last week passed a bill with $5.7 billion in wall funding, though it was seen as dead on arrival in the Senate as it was clear it would fail to reach a 60-vote hurdle. The president during a trip to visit U.S. troops in Iraq on Wednesday doubled down on his demand for $5 billion for a border wall to end the shutdown, now in its sixth day. “Whatever it takes. We need a wall. We need safety for our country. Even from this standpoint. We have terrorists coming in through the southern border,” he told reporters. 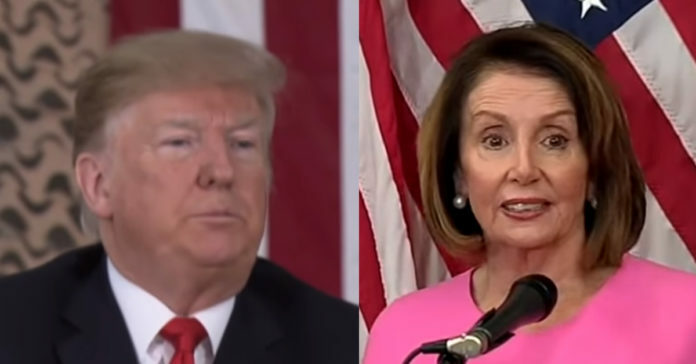 President Trump early Thursday resumed his feud with Democrats on Capitol Hill over funding for a border wall, claiming that most of the hundreds of thousands of federal employees furloughed or forced to work without pay due to a partial government shutdown are Democrats. “Have the Democrats finally realized that we desperately need Border Security and a Wall on the Southern Border. Need to stop Drugs, Human Trafficking, Gang Members & Criminals from coming into our Country,” he tweeted. “Do the Dems realize that most of the people not getting paid are Democrats?” he added. The critics have been going all in on trashing President Trump and blaming him for basically all of the country’s problems. One unfounded criticism is that Trump hasn’t visited the troops in harm’s way, specifically Iraq in Afghanistan. The fact is Trump has visited the troops and was planning a visit to the frontlines but the last minute government stalemate that led to a shutdown and threw these plans in disarray… but also presented an opportunity. If the Democrats took their ball and left Washington to go home, Trump could do the same but instead of going to visit his family, he would go visit the troops. From ABC: President Donald Trump went to Al Asad Air Base in Iraq on his first visit to U.S. troops in the the Middle East as president. Trump’s visit comes after the president’s decision to withdraw American troops from Syria surprised Washington, blindsiding lawmakers, members of the administration and American allies across the world and on the ground fighting Islamic State in Syria. Mike Huckabee was stunned as were most sane Americans when the media industrial complex went after President Trump for comments he made to a 7-year-old about Santa Claus. Talk about Tump derangement syndrome. So Mike went after his cohorts in the media with his devastating wit and exposed them all. From Fox News: The president and first lady made a series of calls on Christmas Eve, and Trump was heard asking a child if she believed in Santa. 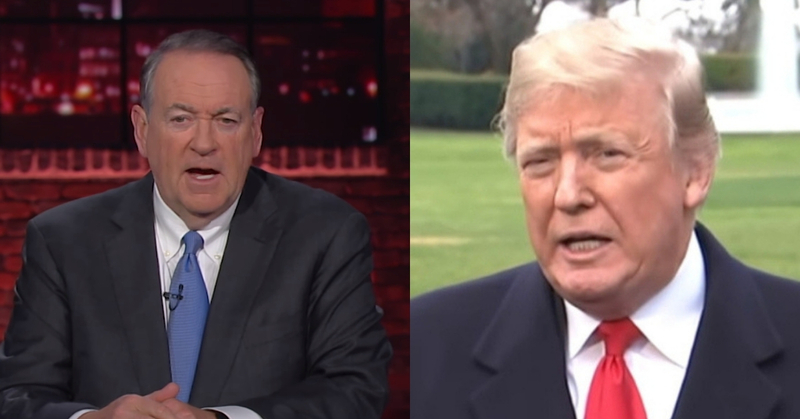 Huckabee said on “Fox & Friends” that the reaction to Trump’s conversation contributes to the “disgust” and “disdain” Americans have for the media. Not only is that supposed media imbalance unfortunate for Trump himself, Huckabee added, it’s unfortunate for the American public. This is just the latest in a string of ludicrous attacks on Trump from the left. What is strange is there are many legitimate areas one could disagree with Trump, the guy is not perfect and has made some big mistakes. They don’t do it though, instead, they play this tabloid journalism game where everything is a sensational story ending with Trump as a monster. That they tried to take a nice moment, Trump taking the call, into a hit job is a new low even for the media. The ignorance on the left is nothing new but the arrogant certainty with which they preach their falsehoods is new. It used to be that some of our politicians knew nothing and rather than open their mouths and remove all doubt they were ignorant, they kept silent. 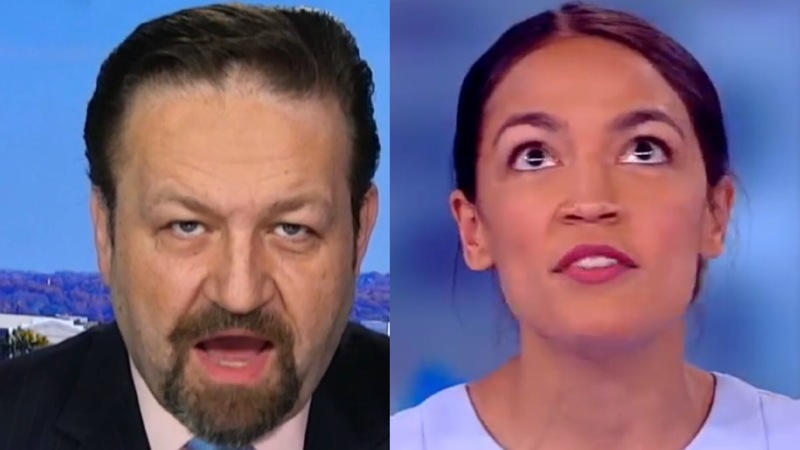 Not this new crew of socialist all-stars, they refuse to let facts and embarrassment get in the way of their talking points and thankfully we have people like Sebastian Gorka to set the record straight. Ocasio-Cortez came under fire over her Christmas tweet when she compared it to the immigrants who are at the U.S.-Mexico border. She has previously compared the migrant caravan to Jewish families fleeing Nazi Germany. “Merry Christmas everyone – here’s to a holiday filled with happiness, family, and love for all people. (Including refugee babies in mangers + their parents. ),” Ocasio-Cortez wrote on Twitter. Mary and Joseph are not depicted as refugees in the Nativity story. According to the Gospel of Luke, Joseph brings the pregnant Mary to Bethlehem so that he may enroll in a census ordered by the Roman emperor Agustus. The couple are forced to take shelter in the stable where Jesus is born due to a lack of room at the inn. The Holy Family escape the slaughter and are told by an angel to return to Israel once Herod is dead. “You really should read the Bible @Ocasio2018. Mother Mary and St. Joseph were NOT refugees. Exactly the opposite of a refugee or an Illegal Alien. Facts: TRY THEM.